When SG-1 makes first contact with the planet Pangar, the Pangarans are anxious to initiate trade with Earth. They seek stargate technology and gate addresses to known Goa'uld worlds and in exchange they offer a miraculous drug called tretonin which strengthens the immune system and allows them to live in almost perfect health. Their interest in Goa'uld worlds is suspicious, and Jonas is convinced that the Pangarans are hiding something. At night, he and Teal'c break into a guarded facility where they find vats teeming with Goa'uld symbiotes, and the Pangarans admit that the symbiotes are critical in the manufacture of tretonin. Many years ago, archaeological excavations on Pangar had uncovered a Goa'uld queen in stasis, and she had been bred in captivity to produce the offspring for the manufacture of tretonin. However, a genetic flaw in the offspring has limited the effectiveness of the drug, and because it suppresses the natural immune system, the population has become dependent. Furthermore, the queen is dying, and if another cannot be found, the Pangarans will face death. SG-1 seeks help from their allies, and Malek and Kelmaa of the Tok'ra arrive to assist, hoping that an antidote for the tretonin can be found. Teal'c and Jonas, who have been assisting with the excavation of temple ruins, make a horrifying discovery. The Goa'uld queen whom the Pangarans have been breeding is in fact Egeria, the founder of the Tok'ra. Kelmaa frees the Tok'ra queen and gives her life so that Egeria might use her host. Egeria explains that the genetic flaw in the symbiotes had been deliberate in order to convince the Pangarans to end their experiments. However, Egeria knows that she is dying, and in a final act of compassion she shares with the Pangarans the knowledge to produce an antidote to the tretonin and to save their people. Ra used Pangar as his base of operations in this sector of the galaxy for centuries until Shak’ran, a rival System Lord, captured Pangar in battle. Shak’ran built his temple on top of Ra’s earlier temple and ruled Pangar as his homeworld until he was eventually defeated by Apophis, brother of Ra, about 300 years ago. The temple writings indicate a prison or tomb for an enemy of Ra, “Here lies Egeria, betrayer of the Goa’uld. May she suffer for all eternity.” Egeria, originally believed to be dead, is the founder of the Tok’ra movement. The Tok’ra are now facing extinction. Sixty years ago, archaeologists discovered a secret chamber beneath the temple with a sealed canopic jar containing a living female symbiote perfectly preserved in stasis. The Pangarans had been conducting medical experiments on her for over 50 years, and have been breeding symbiotes for the production of tretonin for about 30 years. Symbiote queens are able to fertilize their own eggs, making reproduction essentially an asexual process. Goa’uld offspring are born with the intellect, knowledge, and memory passed on genetically by the queen who bore them, allowing them to be born with the collective knowledge of their lineage. The knowledge imparted on her young by a queen is done so voluntarily. If nothing were passed on, the symbiote would be an empty vessel. Egeria deliberately passed on a flawed gene that gave tretonin its weakness. Tretonin makes the immune system impervious to any ailment, allowing people to live in perfect health. It suppresses the normal human immune system, resulting in a powerful resistance to disease, but the user’s own immune system remains suppressed and the drug must be taken consistently for it to work. About 20% of the Pangaran population is taking tretonin. 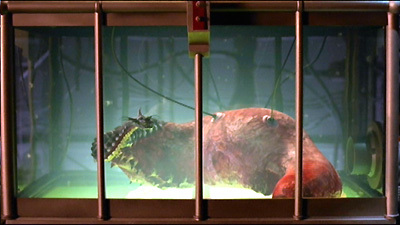 Prior to the process of using Jaffa for the incubation of Goa’uld symbiotes, the blending between a Goa’uld and host had only a one-in-two chance of success. The Jaffa were created for the very reason of improving the ability of the symbiote to take human hosts. A failed blending usually results in death to both the Goa’uld symbiote and the host. Normally a fully developed personality would emerge upon blending, allowing the symbiote to control the host immediately. The Tok’ra are able to remove a symbiote without harming the host, but the procedure is dangerous. Jonas is able to translate ancient Goa’uld writings. Goa’uld writing is read from right to left.